Award Winning Atlanta, Georgia Progressive Metallers HALCYON WAY have been confirmed for a lengthy tour with SAXON and SKID ROW across Europe in October-November of 2014. This tour announcement is hot on the heels of the North American release of their 4th album, Conquer, which hit the Billboard Heatseekers Chart at #41 the week of release. Conquer will be released on September 19 in Europe and the Rest Of World via Massacre Records. "Last year when we were out with SAXON in US/Canada, we had an amazing time and the SAXON guys were great to us. We had conversations with Biff and the guys about doing it again, and here we are! 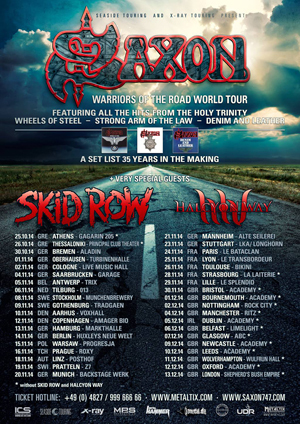 We're very excited to be hitting the road in Europe again, and to be hanging out with our friends in SAXON and new friends in SKID ROW," said vocalist Steve Braun.